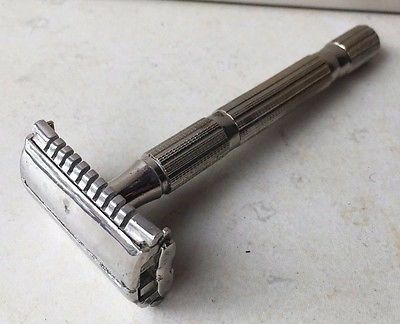 It’s time to trade in your plastic razor and for a nostalgic, vintage-style metal razor!! The only part you have to replace is the razor blade itself, which costs approximately $10 for 100 replacements! Can you imagine the savings? That’s 0.10 cents per replacement and no plastic waste! I’ve found several companies that offer plastic free packaging! The razor is metal and much heavier than your average plastic razor, so it takes a little while to get used to it. The initial razor costs $12 and up depending on your pick. I purchased mine for around $25. So, depending on what kind of plastic razor you currently use, it may be a little bit more expensive up front. However, think of the amount you will save when you only have to replace a $0.10 part rather than the whole razor and the razor head. As an added bonus, you will be eliminating more plastic waste from our landfills. 1. Shave with very little pressure until you get used to handling the razor. It does not take as much pressure to shave with these types of razors. 2. Use shave soap instead of foaming shave cream. It’s cheaper, and easier to use with a metal razor (and less packaging). 3. Lightly, test it on an area of the body less sensitive (such as your leg) before moving to your face, armpits or other sensitive areas. There is a slight learning curve when it comes to using this type of razor.